If you participated in the MEDLIFE McGill Macdonald Branch/Global Food Security Club Krispy Kreme fundraiser, the We Are Aware: Montreal Campaign, or the Mac Basket Food Drive, you likely crossed paths with the ever-cheery Christine Ha, U3, BScNutrSc (Global Nutrition). In the last two years, Christine has been an integral part of the MEDLIFE McGill committee, acting as the Vice President for Local Initiatives. She established the MEDLIFE McGill Macdonald Branch and recruited over 60 students in 2 weeks to join her team; making it one of the only clubs at McGill that spans both campuses and shares resources to bring students from both campuses together. She also established, and is the President of, the McGill Global Food Security Club and has served on the Executive of the Macdonald Campus Student Society and the Dietetics and Human Nutrition Undergraduate Society. Oh, and did we mention that she served on the Orientation Committee and was on the Woodsmen team in 2015? “Christine stands out as a student who, in addition to maintaining an impressive CGPA in a full-time Major, has taken every opportunity to dedicate her time and energy to helping the less fortunate in the community. Her actions speak to the strength of her character,” says Student Advisor Christine Gurekian. Christine’s passion and energy extend into the Greater Montreal community as well. She actively volunteers at the Welcome Hall Mission, the Montreal Children’s Hospital Emergency Room, the Yellow Door, the Make-A-Wish Foundation (3 wishes granted, 5 in progress) and the Special Olympics Quebec: Lac St. Louis Chapter (she is a Certified Competition Basketball Coach for athletes with intellectual disabilities). Christine is one of only a handful of Macdonald students who have received both the Gold Key, awarded by the Macdonald Branch of the McGill Alumni Association, and the Scarlet Key, awarded by the McGill Alumni Association. 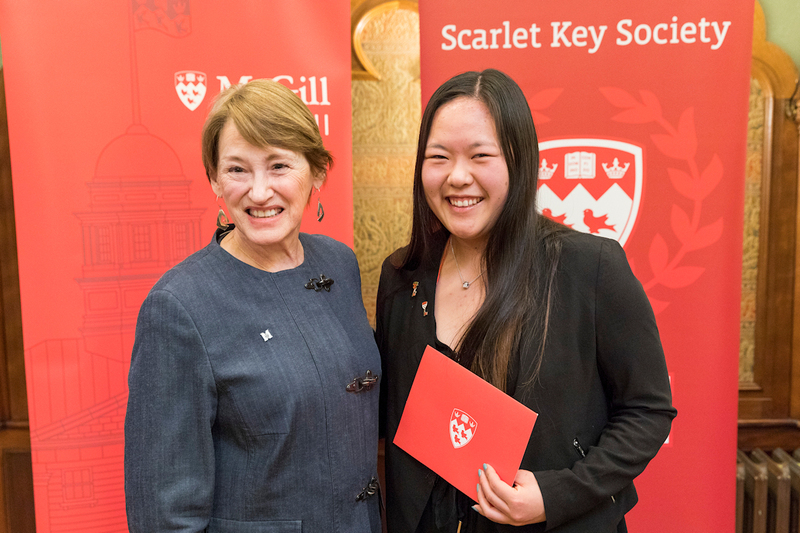 Christine is pictured here receiving her Scarlet Key Award from McGill Principal Suzanne Fortier.